Below are avenues that Niffer’s Place Utilizes to help support our communities. We also participate in restaurant giveback nights to which more information can be found under "Restaurant Give Back Nights" or by clicking here. Please note that we are unable to offer cash donations of any kind other than through one of our three fundraising drives (Niffer's Restaurant Nights, Sponsorships or Food/Gift Card donations). Niffer’s Place strives to support our local communities in the most beneficial way possible. As a result, requests for gift certificates and food will only be considered if the donation will be used toward raising funds to support your organization's mission. Our standard donation is one $25 gift certificate per organization event. Should you have a need for more please relay in the application exactly what you are hoping for and why (i.e. I need $100 in gift certificates because I'd like Niffer’s Place to be the sole team sponsor and the t-shirts will cost us $95). 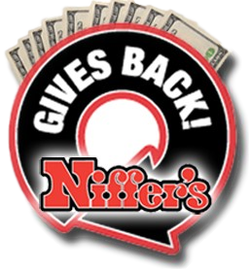 For Food donations and Sponsorships, please explain your cause and how you feel that Niffer’s would be a good fit for this cause. Please make sure that you have read and understand the guidelines for a Charitable Contribution.